As you give back to your community, please remember McMillen Health. Your gifts allow us to continue our mission. Just $18 educates one student about drugs, bullying, puberty or nutrition. $60 will help fill our Outreach van's gas tank, which engage students in learning vital preventive health lessons. $95 helps cover the cost for printing one Brush! parent newsletter to teach about good oral health to young children. $150 allows one school to receive a distance education session at no charge. Education today for a healthy tomorrow! Help McMillen Health while you shop! Amazon Smile: Amazon will donate 0.5% of the price of eligible purchases to McMillen Health when you shop with AmazonSmile. 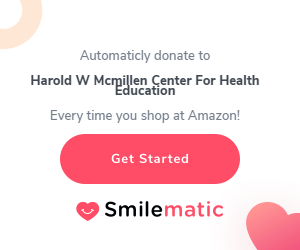 Tip: Make it easier using the browser extension Smilematic which will automatically redirect you to AmazonSmile whenever you shop at Amazon! Kroger Community Rewards: Sign up online to support McMillen Health (organization #16434), and Kroger will donate to us every time you use your Kroger card. McMillen Health has a variety of volunteer opportunities. Opportunities include helping at special events, assisting with assembling mailings and special projects.